I know that many of the shops, both on the High Street and online have started to release their Autumn ranges, but as we are still in the throws of the Summer months I think it’s well worth hanging onto the sunshine in our homes for as long as possible. With this in mind I’ve found some gorgeous summer products that I wanted to show you, that help keep Summer alive both in our homes and outdoors. They are very girly and feminine but maybe you can find a room in your home that could accommodate these very pretty, pastel cushions from the Sweet Home London. Don’t they look good enough to eat? Used together, as in the shot, with the multitude of colours they look stunning, but would look equally as good if you chose just 2 of the colours to co-ordinate together. Available on a sale with Hush Hush at the time of writing for just £9.50 each. 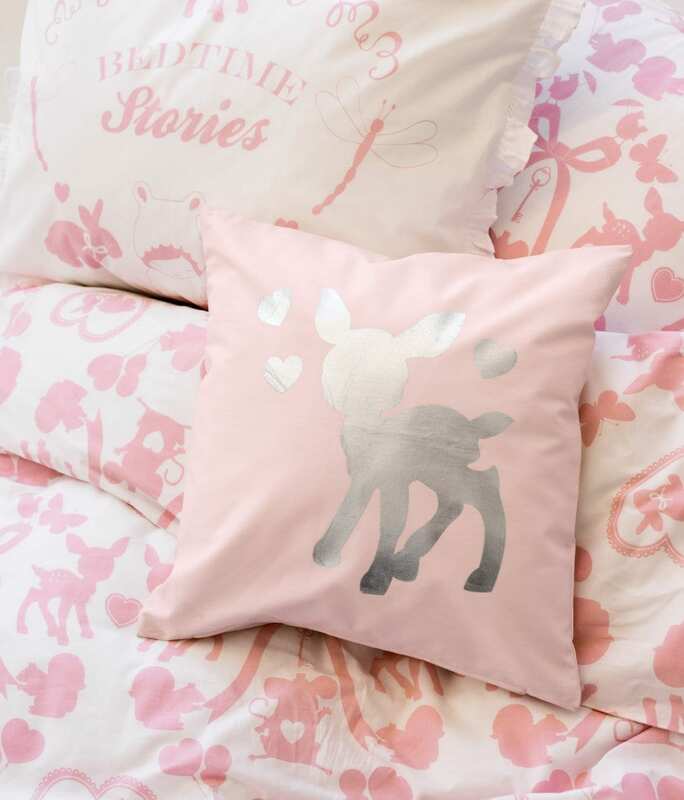 Continuing the pastel, fresh theme into the children’s bedroom, I found this delightful bedding and accessories set at H&M Home which I absolutely adore. It’s cute, sweet and ever so pretty and I can imagine every little girl just loving this in her room. It also fits well with the ongoing theme of woodland creatures that has been prevalent in our home interiors for a while now. I’ve written before about the H&M Home range and how it’s well worth taking a look at their stylish designs and affordable prices. This single bedset retails for just £12.99 and comes complete with pillow, whilst the lovely little cushion is just £6.99. There’s a bigger range available online that even includes a co-ordinating wall sticker so do check it out. Ideal for little people. 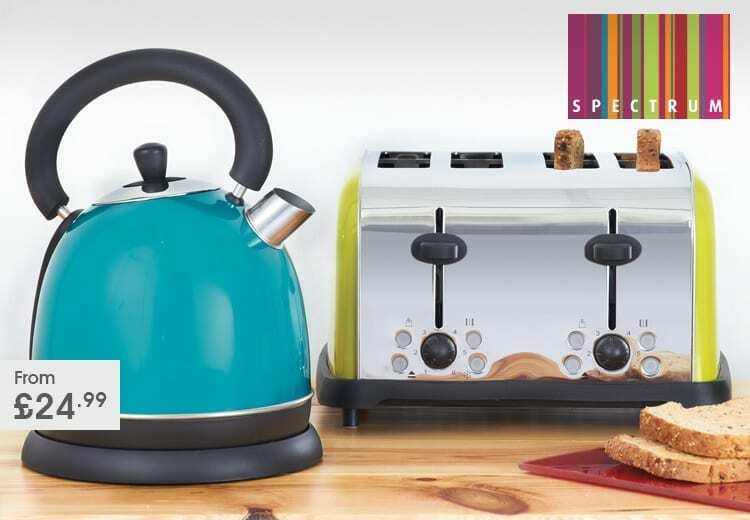 Available at Dunelm, these bright, colourful kitchen kettles and toaster will certainly keep the summer alive in your kitchen. Spectrum have this zingy range at great prices, in all kinds of bright, wonderful colours which, I think look just great. Coloured kettles, toaster and even microwaves are really popular and sometimes easier to get hold of than the regular stainless steel versions that have been around for ages now. Many of us are really keen to add an injection of colour into our kitchens and brighten up meal preparations with these bold gadgets. What about you? Could you live with this kind of Zingy colour in your kitchen? Or do you prefer the softer pastel shades? 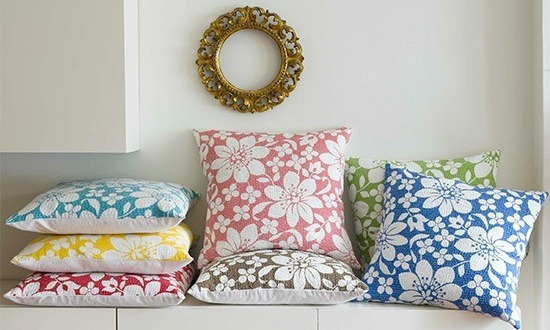 Whichever you go for, all of these suggestions are great ways to add colour into your home, particularly if you’re feeling a little nervous about doing so. They won’t break the bank and they can all be easily replaced if you ultimately decide this kind of colour isn’t for you.